Get a glimpse of Ethan Hunt back in action in the latest round of set photos for Mission: Impossible 6, which come to us by way of Just Jared (tip of the hat to CBM). 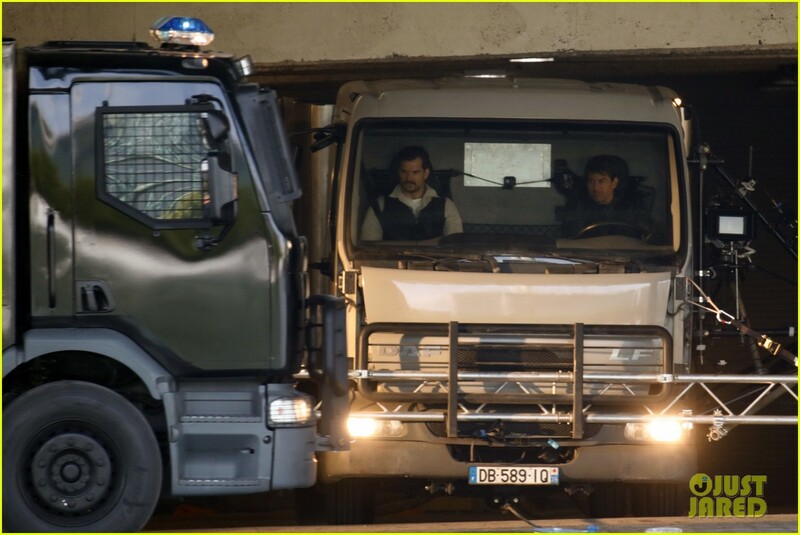 Filming continues apace on the Paris set of Paramount and Christopher McQuarrie’s action sequel, and these all-new set pics seem to showcase Tom Cruise and Henry Cavill going undercover, a potential new love interest for Ethan – played here by franchise newcomer Vanessa Kirby (The Crown) – and Cruise straddling a motorcycle with a great big smile plastered on his phase. Even at 54 years young, Hollywood’s greatest daredevil hasn’t lost his appetite for spectacular stunts, as evidenced by yesterday’s gripping featurette for The Mummy. When it comes to M:I 6, though, there are precious few story details currently available for Paramount’s 2018 tentpole. One thing’s for sure though: the franchise’s go-big-or-go-home mantra very much remains intact, after it was revealed that Tom Cruise has spent the past year training for a blockbuster action sequence – the details of which are being kept firmly under lock and key. He’s scaled the Burj Khalifa and clung on to an A380 mid-flight, so there’s no telling what Cruise has in store for Mission: Impossible 6. That being said, McQuarrie has hinted in the past that the upcoming sequel will introduce viewers to a “very different” Ethan Hunt. After five movies of accepting increasingly impossible missions, it’s almost time to find out exactly who Ethan Hunt really is – at least, that’s the idea. Mission: Impossible 6 is booked in for release on July 27th, 2018. Long before that, Tom Cruise has the small matter of dealing with Universal’s reanimated version of The Mummy, which is expected to loom over theaters in exactly one month’s time.